How are we empowered by Freeing the Five? If we accept the hypocrisy the trial and conviction of the Five represents, our respect for our country, our principles and the sacrifices made through out history for those principles becomes impossible to maintain. Our patriotism must be based on the integrity of those principles. They are our foundation of truth, our connection to the reality of our growth and maturation as a people. The sum of our experience, struggling against the impulses toward oppression, exploitation and tyranny, has brought us to this point and represents the progress we have made. These principles spell out for us the text of our journey and map our approach toward the challenges that lie ahead. When challenges to these principles are presented we have an opportunity to measure how correct they are and, if they prove true, our own fidelity to them. The case of the Five presents us with just such an opportunity. Their courageous efforts to secure the integrity of the borders of Cuba and the United States expose for us the corrupt and mendacious activities by those who would retard the advance of our citizenry toward a more just and rationally based community of human life. Exposed too are the contrivances of the mass media. Their contortions and convolutions to distort and mislead the agents of change, working people, to ensure the hoarded wealth is kept safe from those who labored for it. The american people are prepared for the challenge that this case presents for us. We have allies around the world that look to us for the leadership this moment tests our abilities with. We will not fail them, the Five or ourselves. With the spirit of our Grandmothers and Grandfathers hardening our resolve, justice will be done and the bell of liberty will ring "Freedom for René, Fernando, Ramón, Antonio and Gerardo". Our Memorial Day weekend this year was a trip to South Carolina and another visit with Rene Gonzalez, this time at FCI Edgefield near the border with Georgia and next to the home of the Masters golf tournament, Augusta. From our home in Philadelphia, it is about a 12-hour drive to Edgefield,through Delaware, Maryland, Virginia, North and South Carolina, all with histories steeped in liberation struggle. We drove south through the night, and the spirit of that struggle filled the landscape of cities, farms, factories and neighborhoods keeping us company on our long journey. This visit was special. We had planned to spend Thanksgiving in Bradford, Pennsylvania, visiting Rene at FCI McKean but he was moved, on short notice and arbitrarily to Atlanta and then to Edgefield, where a new visitor's list was started and new applications to visit had to be made. Then, in blatant violation of all codes of legal and moral norms and conventions (national and international which serve to protect society from the injustice of tyrants and torturers) in a futile attempt to intimidate these pillars of dignity and camaraderie, a month of solitary confinement was imposed on all five at the five different locations across the United States. No one was allowed to visit or have contact with any of the Five. They were severely abused and their natural rights and privileges denied. This occurred at a pivotal moment in relation to their appeal of the infamous Miami court convictions. Mass pressure and agitation succeeded in ending their isolation punishment and finally our visiting privileges were reinstated. Morning broke as we entered the state of South Carolina and soon we were welcomed at the home of a Quaker couple who had generously offered to give us a place to sleep while we were in the area. After a short rest, we were off again for the last 50 miles to the Federal Correctional Institution at Edgefield. The contrasts that appeared on our way were dramatic. 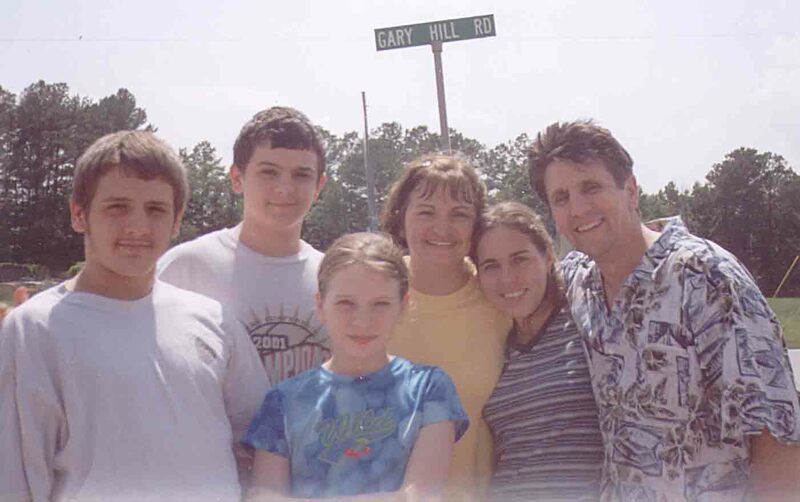 This is 2003, the 21st century; the name of the road we traveled was "The Strom Thurmond Highway". As we entered Edgefield, we passed Strom Thurmond High School. In the center of town, there was a larger than life bronze statue of Strom Thurmond. This in the state that was home to Denmark Vessey, a founding father in the American tradition of just struggle. An African who constructed the highway to dignity and truth through organized resistance to tyranny. Who was Strom Thurmond? A racist, a bigot, one of the most outspoken reactionaries in support of segregation and the use of law to enforce the subjugation of African American people. The prisoner we are visiting in the hometown of this holdover from the 19th century is a veteran of the struggle against the apartheid regime of South Africa. Threatened with invasion by the US armed South African army, the government of Angola sent out a world wide SOS. The Republic of Cuba responded, Rene Gonzalez and 300,000 of his compatriots changed the course of history, humiliating the apartheid forces and articulating the principle of African peoples unity and justice across the globe. How can it be? In the land of the free and the home of the brave the imprisonment of one of these creates a contrast that would seem intolerable. What could this foot soldier in the battle against oppression have done to be incarcerated in the land of liberty? The "crime" a Miami court charged Rene and the others of was conspiracy to commit espionage. The evidence used to convict them proved beyond a reasonable doubt their acts of non-violent resistance to terrorist attacks on their home land of Cuba from thugs and criminals based and funded from these United States. Contrast and coincidence, here we are in the middle of an all out mobilization against terrorism and in the same state (Florida) that gave us the maxim "don't count the votes" for da Mock racy comes the invocation "convict now lest justice prevail". Fear motivates the logic of the oppressor and truth is its most potent enemy. The case of these Five Cuban patriots exposes a truth about the corrupt policies of US international relations based on a domestic agenda that is nourished by inequality and privilege. Our trip to the South Carolina, Georgia border area was filled with evidence of the context created for sustaining injustice. In Augusta, Georgia, there is a history exhibit about the production of cotton. Everyone knows cotton industry history in this country is inseparable from the institution of slavery. Yet most of this exhibit is about the cotton trade from the perspective of the cotton baron, slaves and slavery are a minor part of the story. The truth of the criminal brutality and moral bankruptcy of the ruling class that fostered slavery and enriched itself at the expense of so many is completely obscured. Such is the framework within which the much-heralded "free press" of the USA operates. Distortion is its watchword. Commercial media is bad enough with the open lie method of selling the elixir of bliss. However, it is the so-called "public" media that gives substance to Goebbels strategy of the big lie in ways that make one shiver with revulsion. National Public Radio, All Things Considered, Fresh Air, Frontline, these are the uncensored thoughts of the big bourgeoisie describing the myth of the world as they demand it to be. This is propaganda in the service of exploitation. That is why the arrest, imprisonment, trial, conviction and sentencing of five committed anti-terrorists is possible without a syllable uttered in protest, inquiry or comment regarding the hypocrisy and injustice that saturates this case. Our visit with Rene Gonzalez on this Memorial Day weekend (remembering the sacrifices made in the service of truth) has special significance. When entering a prison each of us struggles with the inhumanity built-into the confinement culture. The reality of our visit with Rene is a metaphor for destroying barbed wire, bars and cement blocks. His confidence permeates the entire room immediately changing the posture of all from defense to offense. It reminds me of the stories of Mandela on Robins Island, where the experience of integrity and moral fortitude created an impossible task for the jailers whose job it was to subjugate the jailed one. Our second day visiting was greeted with a miracle of prophetic proportions. As we were waiting in the visitors area a young person whose features were familiar to us came in. It was Irmita, Rene's 18 year old daughter. A tireless advocate in the service of defending the dignity and integrity of her father and her country. We were treated with a reunion that could only reinforce our respect and appreciation for the tenacity and humanity of Cuban values and understanding. Father and daughter are an expression of love for truth, commitment and discipline that spills out and over the prison walls. The intricate and verbose machinations of a society based on a lie are vaporized by this union of two souls nursed at the breast of human dignity. We are witness to an epiphany of untold proportions and it wraps us up and leaves us dizzy with the awareness of how thoroughly twisted our own culture of acquisition has left us. These two are so easy with each other. In contrast with the surroundings, their bond radiates the message of truth now and ever more. They accept us as family and share the understanding that our struggles are theirs. By the third day of our visit to Edgefield, we are acutely aware of our surroundings and their incongruencies. We part with this humble representative of a rich man's nightmare with a commitment to expose this distorted context. We have been tutored in the curriculum of effective struggle by one of our own. Every nation has its own experience of truth telling and justice building. The United States and Cuba share a potent reservoir of this type of experience. Ours is the rich legacy of Vessey, Turner, Brown, Marti and Che. Our righteous spirit is irrepressible and its appetite for justice insatiable. The concrete, steel and lies of this system can repress for but a short time more. They will melt before the searing heat of our relentless march. Long live the revolution. Free the Five. Flier for Investigative Peoples Tribunal Flier for 12/20 meeting. 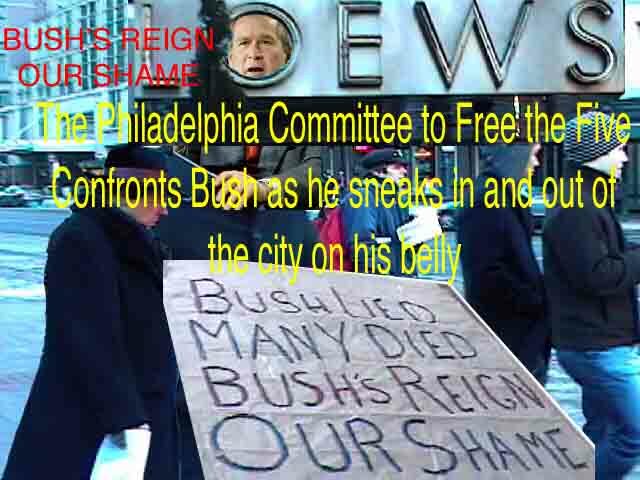 Click here for PDF Flier about Friday, October 17 Vigil for Justice Philadelphia, 4-6pm at NW corner of Broad & Market by statue "Government of the People"